The John Deere 1332PE Snow Thrower comes with a 32 inch clearing width, wide enough to handle most large snow clearing jobs on driveways, sidewalks and small parking lots. 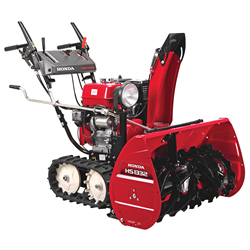 The 4 cycle engine has 16.50 ft-lbs gross torque power powerful enough to handle even the heaviest snow loads. This is one of the large snow throwers so it comes with a standard electric start as well as the usual recoil start for back up situations. Turning is easy with a quick trigger button to lock one wheel while the other turns and you can also turn the chute with the press of a single control as well. As with most snow throwers the transmission is 6 forward and 2 reverse speeds with a friction drive to power the forward and reverse directions. 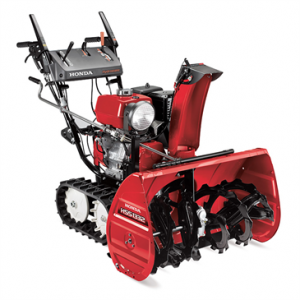 Combined with heated handle grips and a halogen light, this snow thrower should be a pleasure to use in any weather even on the coldest days. Read on for a full list of specifications and features. This is the really important part. You have plugged the augers with snow, you have shut the machine off and now you are trying to clear the snow away. Never place your hands inside the augers to get at the snow. Use a broom handle if you have an old machine, or the snow clearing tool that came with your newer machine to clear the snow. You can also purchase these tools from most stores as an extra if you break yours or if you have an older machine which does not have one. This is the safe way to clear snow from around the augers and the impeller. 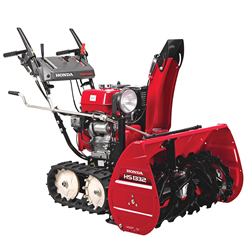 Like all snow blowers or snow throwers, maintenance is important for your machine to operate at a peak level for many years. Change the engine oil regularly. Check the belts for tightness. Change the spark plug as required. Grease any spots outlined in the manual. If you need to leave the snow blower outside all year round, cover the machine with a proper cover to keep it looking new and avoid deterioration of the tires and metal components. The John Deere Dual Stage Snow Thrower 1332PE comes with a powerful Briggs & Stratton (B&S) engine and cuts a swath that is a full 32 inches wide. When combined with the drift cutters, this snow thrower will deal with even the largest drifts that many urban home owners will experience. It is labeled a professional model, with a full year warranty for those individuals who want to use the 1332PE for commercial purposes (most other warranties are 90 days). Large tires and a larger than normal fuel tank make sure that you have the traction and the fuel to get your snow clearing job done. The transmission is of the friction type, which is pretty standard in the industry with 6 forward and 2 reverse speeds. Need help turning, simply press a button to lock one wheel while the other turns and turns the snow thrower in the direction that you want to go. Starting is electric with a 110 V starter or by pulling the recoil starter chord found on all models. There are a lot of features that operators will appreciate especially if you need to spend many hours blowing snow. From heated handle grips with two heat settings to a 200 degree electric powered chute rotation control device and more. Blow snow in just about any direction you wish with the wide angle control of the chute. There are also halogen lights for night time operation and full throttle control to help you manage your speed. Many operators also use the fresh start fuel cap to ensure that the gasoline is always fresh and does not gum up the carb in any way. 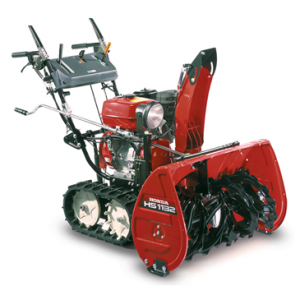 A great snow thrower for urban or commercial use! Delivery: Customers can arrange for in store pickup or they can arrange for delivery for a small delivery charge. Delivery is usually within 5 to 7 days depending on availability and distance from the store. Accessories: Common accessories such as tire chains and snow guards can usually be purchased, however none were listed in the research that we conducted. Online Reviews: We were unable to find any online reviews for the John Deere Dual Stage Snow Thrower 1332PE, however please leave your comments at the end of this blog if you have used one of these machines. Prior to starting the John Deere Dual Stage Snow Thrower 1332PE the first time each day, perform a quick walk around check of the machine to ensure there are no loose parts and no leaking fluids. Check the engine oil to ensure that it is at the correct level as specified by the manual. Top up if necessary. Fill the fuel tank while the engine is cold and prior to using the machine. If you do spill fuel, wait until it has fully evaporated prior to starting the engine. Never spill fuel on a hot engine to avoid fires and always fill the fuel tank outdoors to avoid any possibility of vapors going into your house.